This year was huge for me, with many projects being completed, much travelling done, some A&S teaching, Guard duty and learning of many new skills. Having travelled so much, I had a great time reconnecting with friends and making lots of new ones. Despite all of the travelling, I still managed to complete a heap of projects this year. 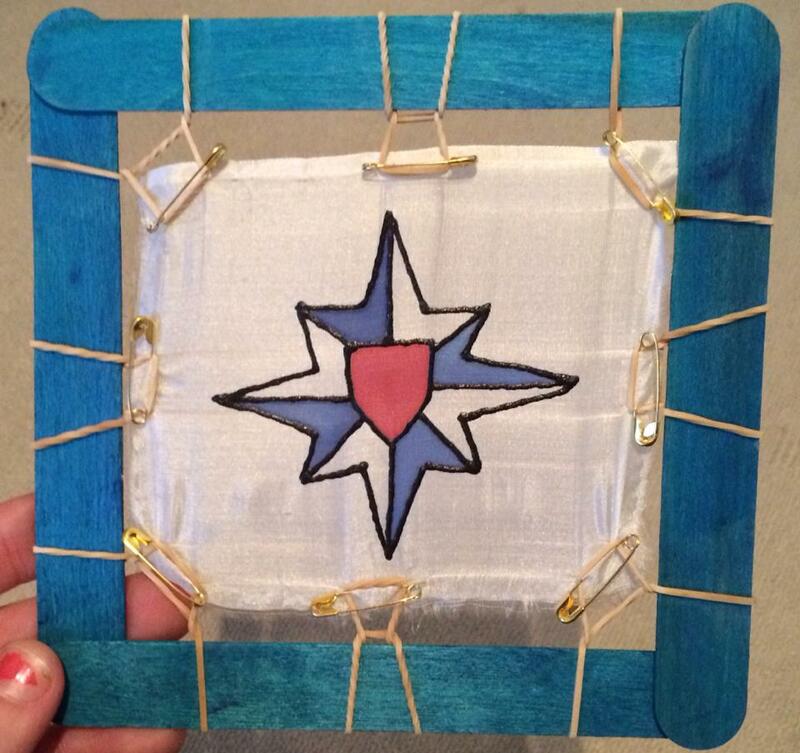 In May, I began this blog to document my A&S projects. It has taken many, many hours to create, to locate as many of my past projects as possible to document on here, and to write up past research for publication. Across the year, I received many things that meant a lot to me. At Twelfth Night in Krae Glass, I was released from His Majesty Henri’s Kings Guard and was presented with a royal cypher from Henry and Beatrice before they stepped down. At the Politarchopolis Baronial Championship I was humbled to receive a token ring from Prince Niall for my rapier performance at my first ever rapier tournament. In June at Pencampwr, Galen gave me a token for being enthusiastic about heavy fighting in his general direction (including goading him in to armour as I beat him to the field, haha). I also received a royal cypher from Their Majesties Felix and Eva. 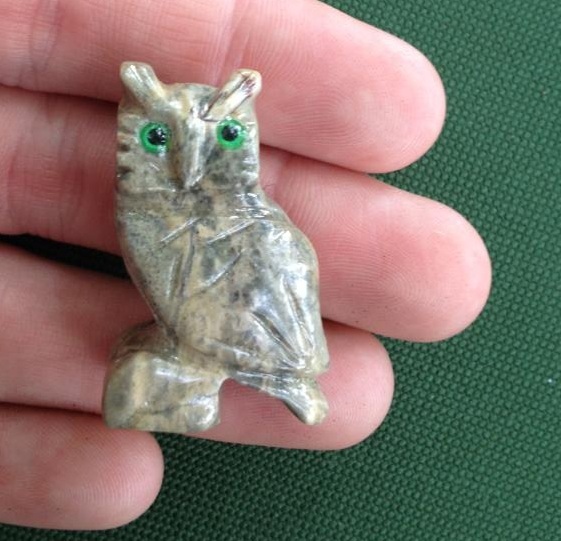 At Pennsic, Don Greybeard presented me with an owl token for my rapier performance across the event, which was absolutely lovely. At the Politarchopolis A&S collegia I was honoured and entirely stoked to receive the Order of the Cockatrice. For Niall and Liadan’s reign, I was appointed as a member of the Queen’s Guard and as one of three Royal Artisans. As part of my placement as a Royal Artisan, I was tasked with creating an A&S project in Her name that would show my skill and inspire others. 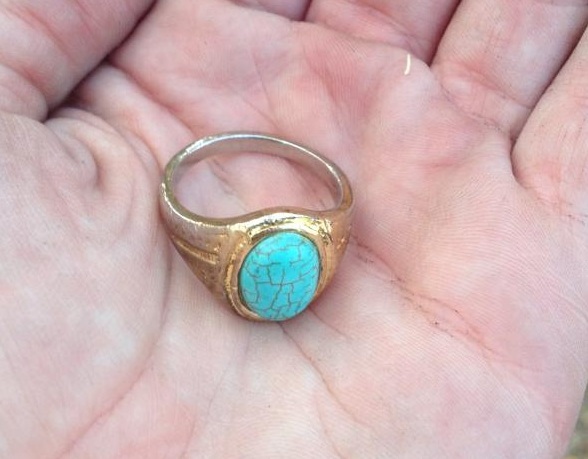 This blog was crucial in documenting my progress with my Royal Artisan project, and it has allowed me to share my A&S class notes, photos and processes with others. This blog is a work in progress with backdating past projects, and I intend to post about all future major projects in on here. 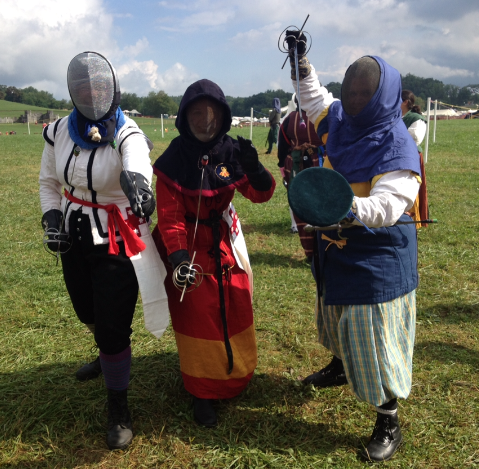 In 2013, I went to several local events, including the Politarchopolis Baronial Rapier Championship, the A&S Collegia weekend and the Fields of Gold events. I also attended weekly Sunday trainings in Politarchopolis every weekend that I wasn’t travelling from April 2013 onwards. This year I travelled to at least 11 interstate/international SCAdian events, including Twelfth Night (Krae Glass), Rowany Festival (Mordenvale), Pencampwr (Aneala), Great Northern War (Northern Reaches), Midwinter Coronation (Mordenvale), Winterfeast Baronial Investiture (Stormhold), La Prova Dura (Innilgard), Pennsic War (Pennsylvania, USA), Knights School (Rowany), Great Southern Gathering (Innilgard) and Rowany Yule (Rowany). I started the year by finishing a linen pouch for Tristan, owed to him from a Great Northern War promissory, with silk thread chain stitch on the lid in a pattern copied from one of his shields. I also made six thread wrapped buttons to decorate it with and wove the drawstrings and handle. 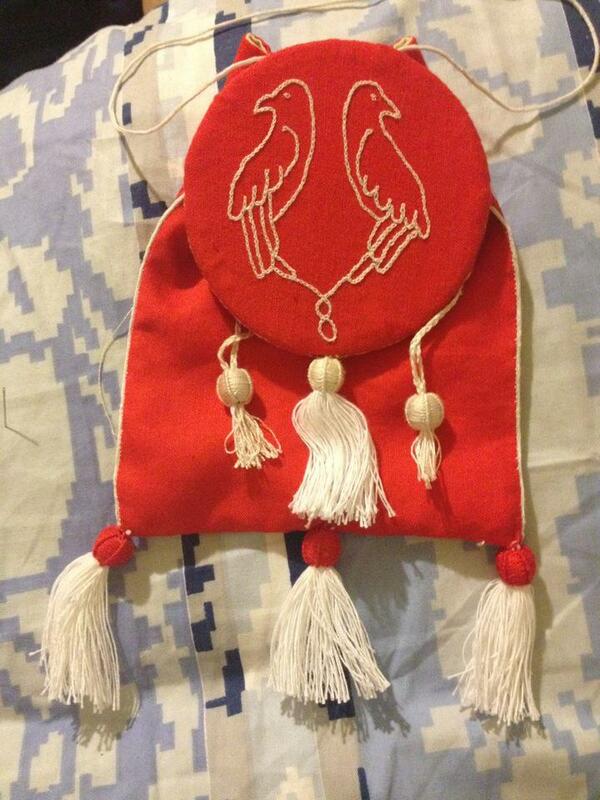 Tristan’s pouch, completed by Ceara. 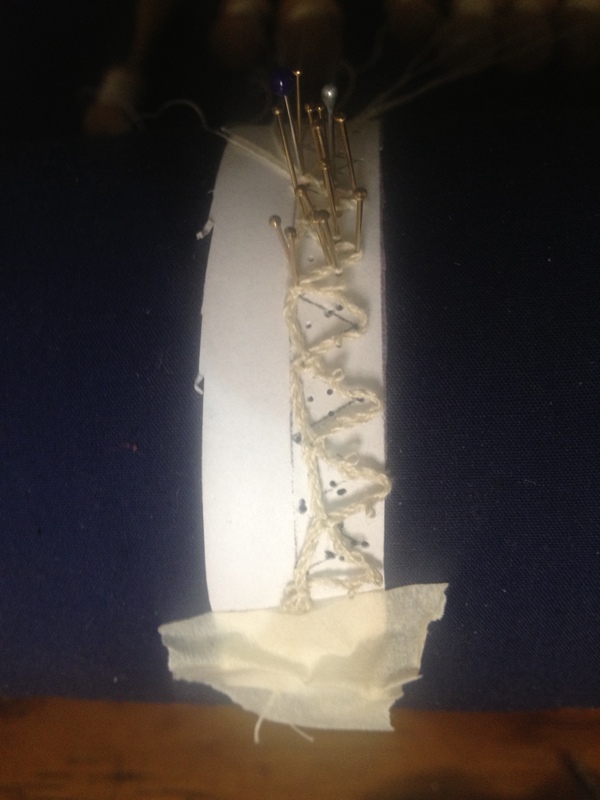 I undertook my second ever attempt at bobbin lace under the guidance of Lady Ursula. At some point I would love to make a period handkerchief incorporating different lace techniques, and this was another step towards that eventual goal. 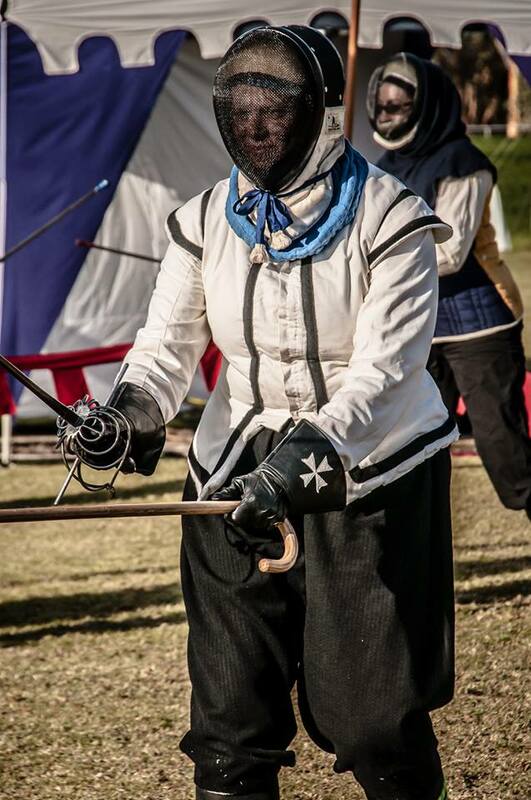 I made a rapier outfit in early May in order to participate in my first rapier tournament. It is in the style of an Elizabethan male costume and is made from linen and wool. Black and white were used in line with my Burbage House colours. 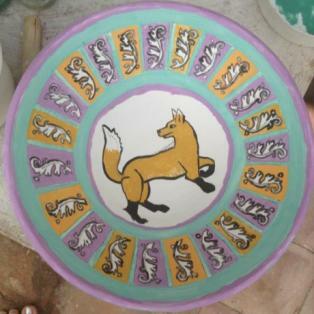 My bowl with all pigments added, pre-firing. 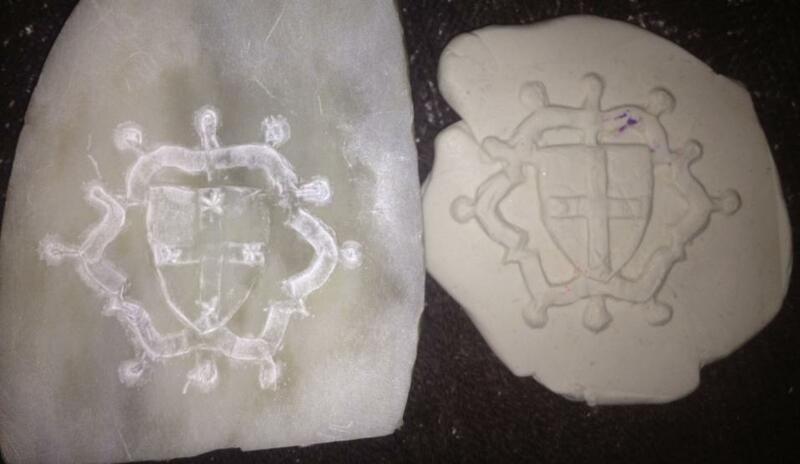 My initial carved mould (left) and test plasticine piece (right). 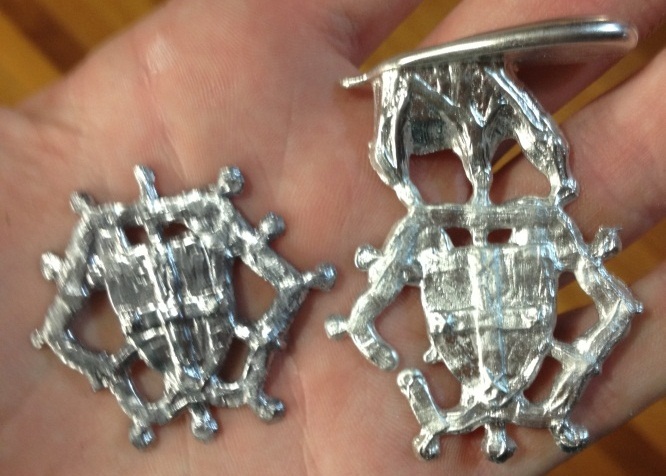 My livery badge results in lead (left) and pewter (right). The pewter would not entirely fill the mould and still has the sprues attached. 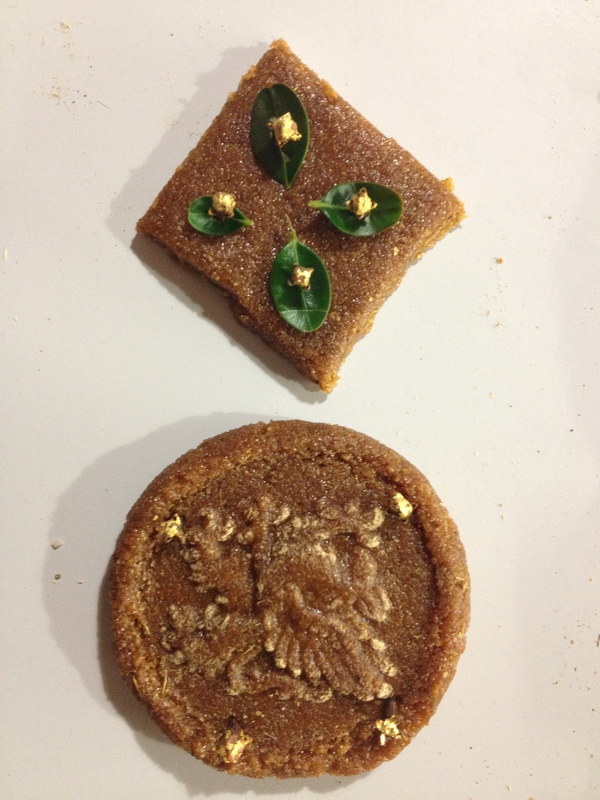 My final items made for the Pentathlon were three different, period recipes of 16th century gingerbread, decorated with impression moulds, gold gilding on the gingerbread, gold-gilt cloves and gold-gilt box leaves. 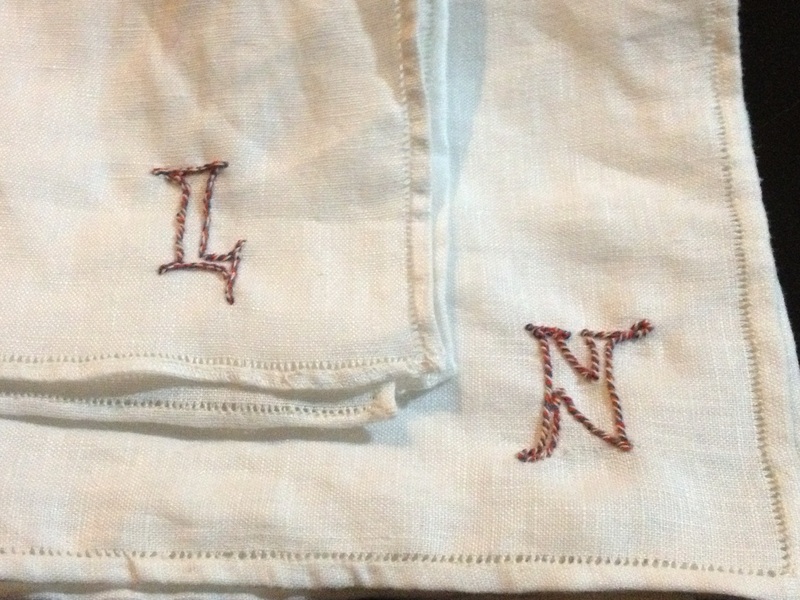 Finished linen handkerchiefs for TRM’s Niall and Liadan, by Mistress Mathilde and Lady Ceara. 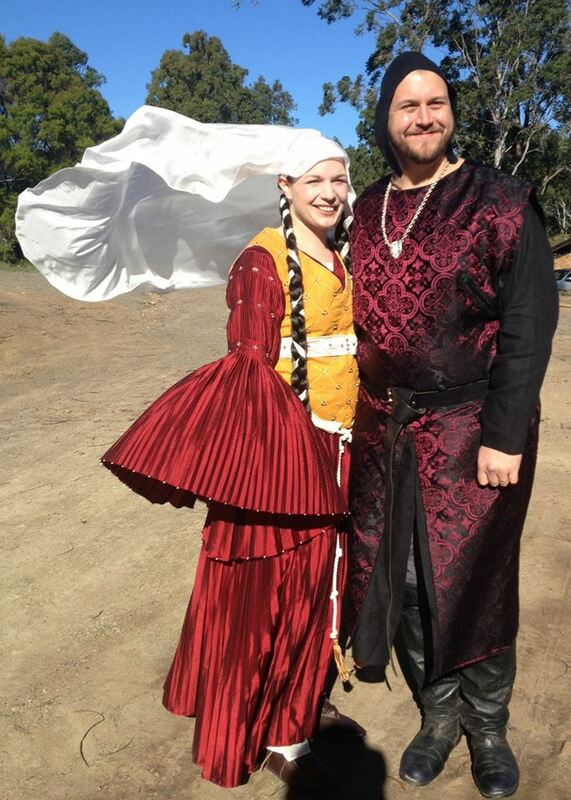 I roll-hemmed most of a large veil for Liadan to assist Ailis (Head of Royal Wardrobe). I also assisted Princess Liadan to make a horseman’s tunic in her own colours, and helped with some gold couching on her Lochac fighting tunic. For Their Majesties Niall and Liadan’s step up, I made a reversible, quartered horseman’s tunic. The horseman’s tunic style was stipulated to be the uniform of the Queen’s Guard, which I was asked to join. 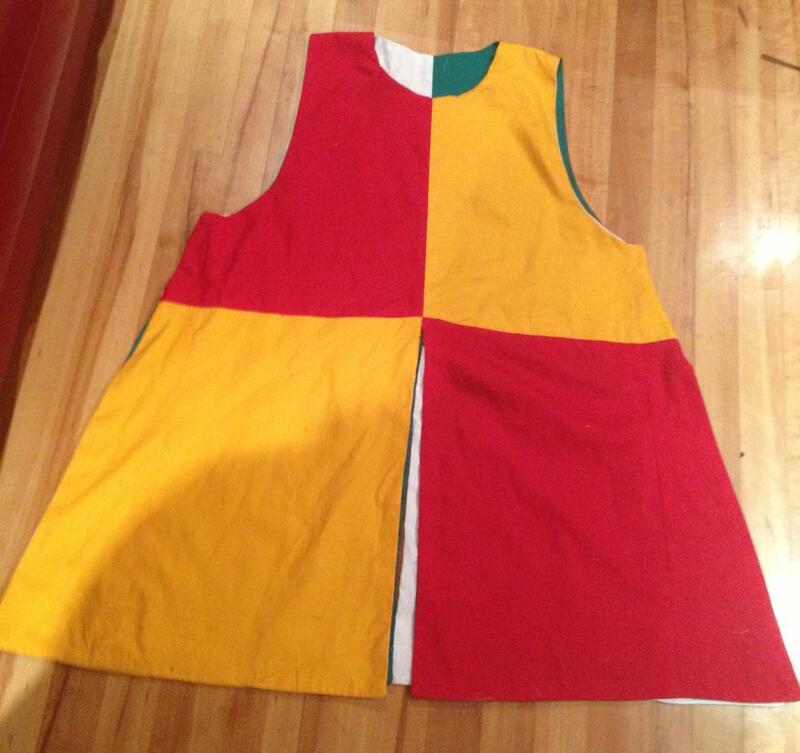 One side of the tunic has the Queen’s colours of red and gold and the other side has my personal colours of green and white. 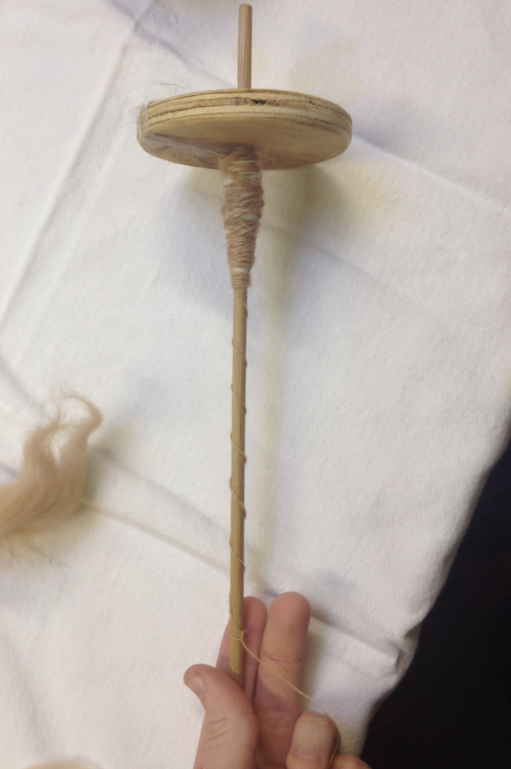 I went to Lady Julianna’s class on spinning at Polit’s A&S Collegia weekend and made my third attempt at spinning wool. 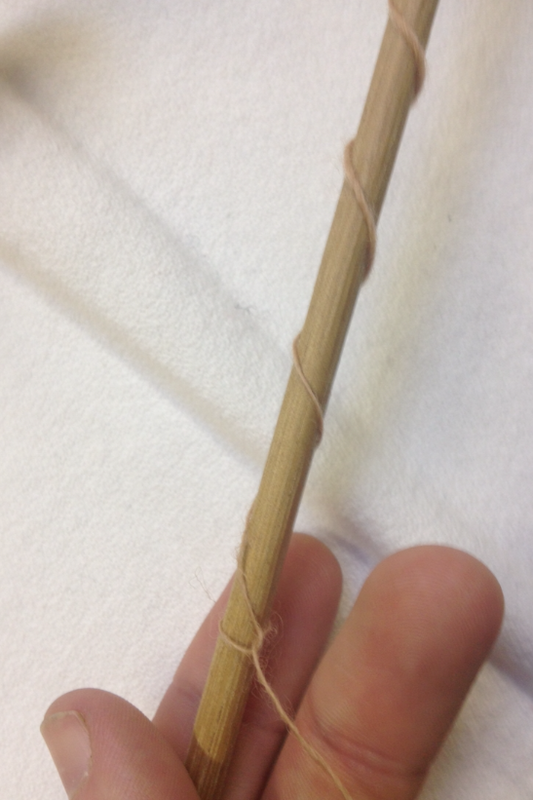 I ended up spinning a medium-small width thread that wasn’t too bad. 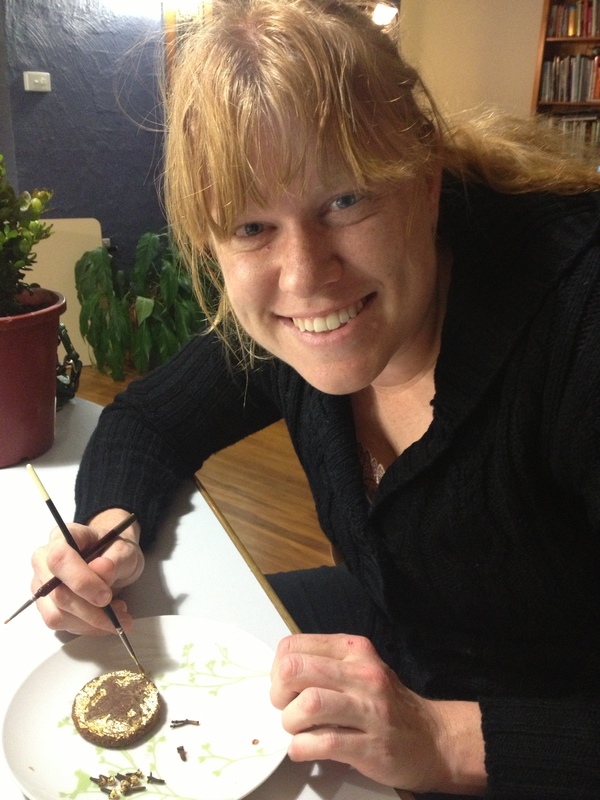 I attended Lady Elizabet’s silk painting class and made my second ever attempt at silk painting. To practise, I made a small Guild of Defence badge. Provosts Lindoret and Gomez liked it and got me to make two more for them. At Rowany Festival, Great Northern War and the Politarchopolis A&S Collegia weekend I ran hands-on classes for making thread-woven buttons, and I published my class notes online. I taught a hands-on class for making a 16th century woman’s caul/coif at the Politarchopolis A&S Collegia weekend, and I published my class notes online. At Great Southern Gathering I taught a hands-on class for an introduction to needlelace. For the Politarchopolis Fields of Gold weekend I organised A&S teachers and the A&S class schedule for the event as well as running an embroidery circle where we showed our projects and discussed embroidery styles. Heavy Fighting – I fought at Twelfth Night in Krae Glass (got to 4th round but had to leave early to catch plane), two tournaments at Pencampwr (single kill, double elimination and in Sir Kane’s challenge that included me being one of the hydra), the Flame Tourney of Great Northern War (which has the best ambience of any tournament I’ve ever been in), the La Prova Dura tournament (many, many hours of bouts in a round robin of all fighters present) and in the Pennsic War Woods Battle with Lochac. Wearing the Lochac colours in war is one of the most amazing heavy experiences, and this is coming from me – someone who isn’t fond of fighting in wars! Rapier – I began rapier after Rowany Festival in late April, authorised in May. 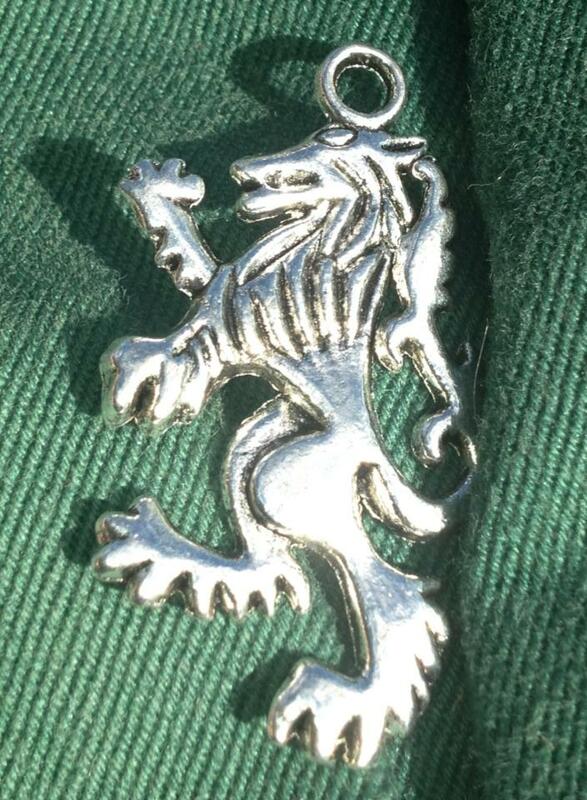 I fought and attained my Free Scholars Prize, sponsored by Don Greybeard, in the Lochac Guild of Defence in October. I was humbled to receive my yellow sash, which was gifted to me from Baron Yevan de Leeds (it was one he wore as Free Scholar that has the Guild of Defence logo embroidered on it). 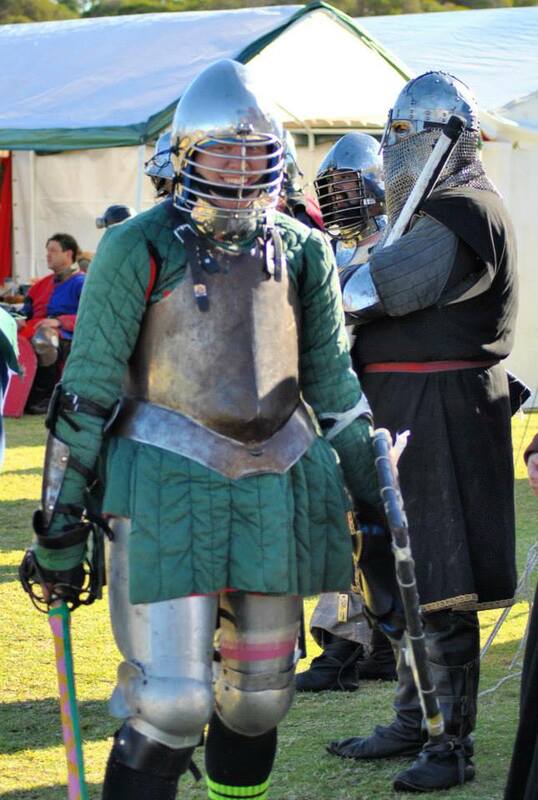 From May I have fought in 17 rapier tournaments across 7 Lochac baronies and against other Kingdoms (at Pennsic War, where I fought 6 tournaments in a week and did pickups several times). 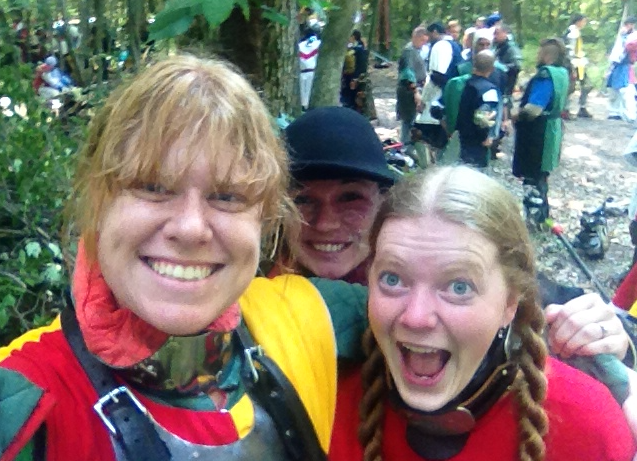 Two of my most notable tournaments were the Valhalla tournament at Pencampwr where I came first of six and the Zen Warrior Lady Rapier tournament qualifier where I beat a Dona to come second of 24 combatants. My favourite tournament was the Aethelmearc Novice’s tournament, which was a 1.5ish hour bear pit (with ten+ stations), where I came 29th out of 49 rapier combatants. Given that you had to be authorised for less than three years to compete, and I had been authorised for 3 months and playing for 4 months, I was thrilled to make it as far as I did against so many combatants from so many different Kingdoms. 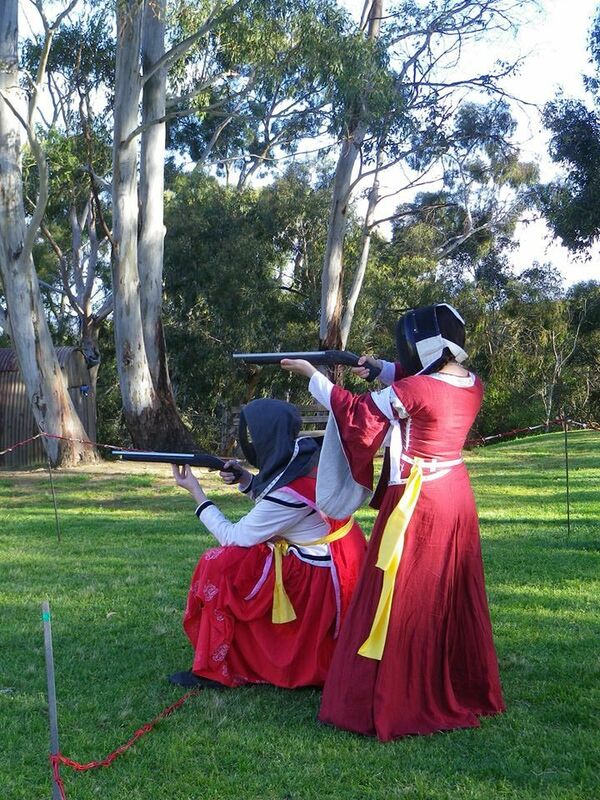 Furthermore, I did so after having competed in two other rapier tournaments earlier that day. Most of my rapier training has been under the guidance of Don Owain, Don Greybeard and Don Francois. However, I have also learnt from my other weekly training buddies and from many other fencers from my copious travels this year. I think my favourite competition ever was the first to six challenge I did against Lord Leif Magnusson for a prize of bacon. I managed a comeback of 0-3 to win 6-5 that day, and boy was the bacon prize worth it. Fun times! 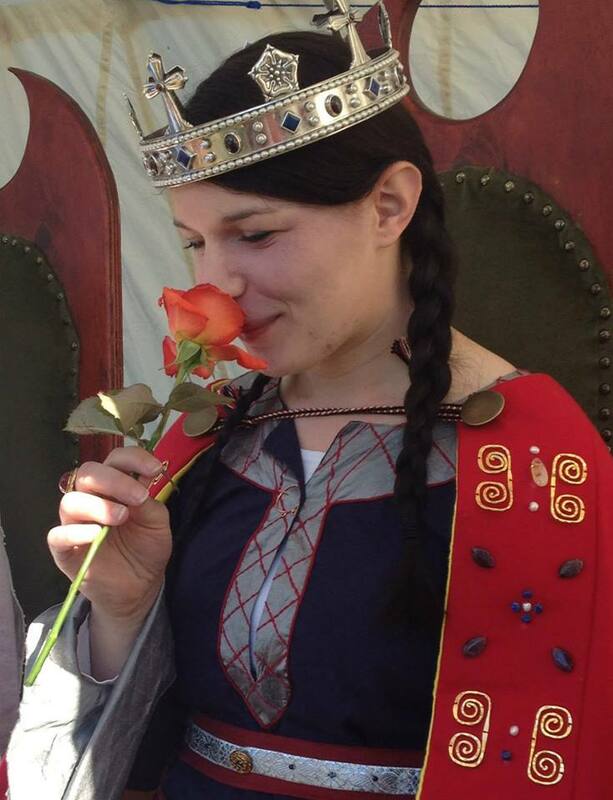 Lastly, I was honoured by the sponsorship of Queen Liadan in the Known Worlde Rose rapier tournament held at Pennsic, and of Baroness Ginevra in the Fields of Grace tournament at Great Southern Gathering. At Twelfth Night in Krae Glass, I volunteered last minute as a judge for the Kingdom A&S competition for making sweet bags. There were four entries from memory, each displaying hours upon hours of embroidery. 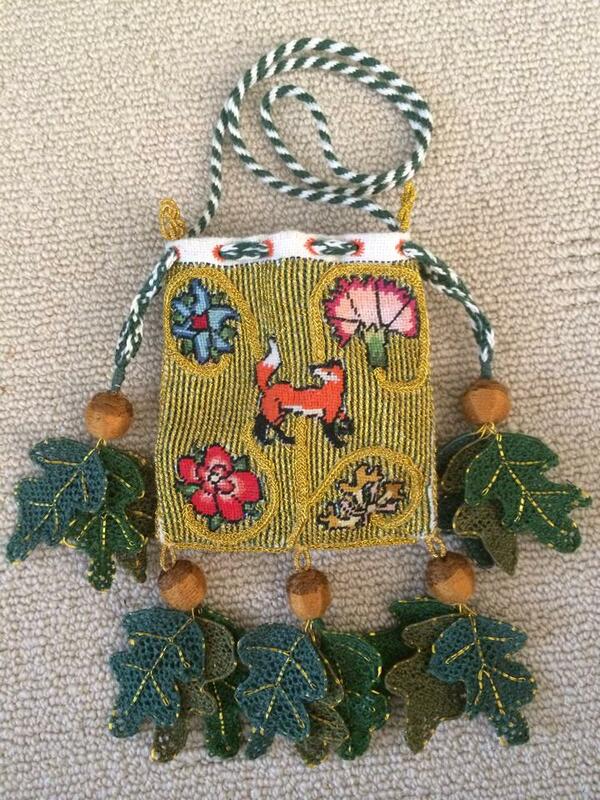 Judging this competition was one of the inspirations that drove me to choose a sweet bag for my Royal Artisan project. At Great Northern War, I volunteered to help with cooking all of the breakfasts. It is one of my favourite things; you get to meet everybody at the event as they wander in, all zombie-like, to get their breakfasts. And, I get to push my normal bacon agenda (team bacon always wins, because bacon). The kitchen crew were, as always, really fun people and we ended up singing to entertain ourselves (and others, as they later commented) as we cooked. I got to put my investigative skills, and my contacts, in to play when Elizabet Hunter needed the 38 names of all current Royalty across the Known Worlde who would be reigning at Pennsic 42. 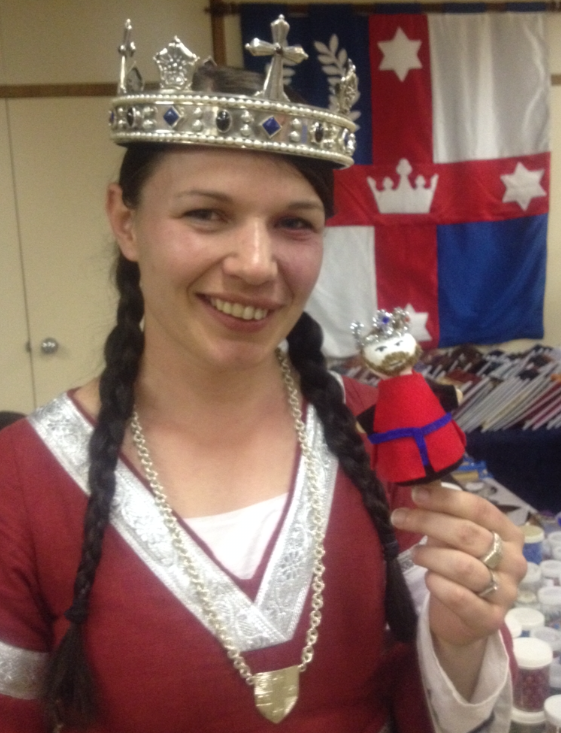 Trust me when I say that it is not an easy thing to do, but I managed to pull through and Elizabet made some clever silk tokens for the Crown to pass out at Pennsic. At the Politarchopolis A&S Collegia, I dressed as one of the heads of my household – Count Stephen Aldred – for an amusing, comedic play. 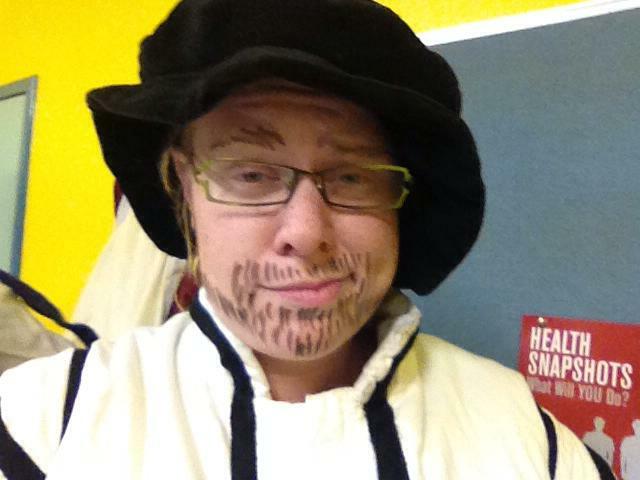 It was the first SCAdian play I’ve ever been in, and it was fun to dress up for it! Me dressed as Count Stephen for the play at Politarchopolis A&S Collegia weekend. 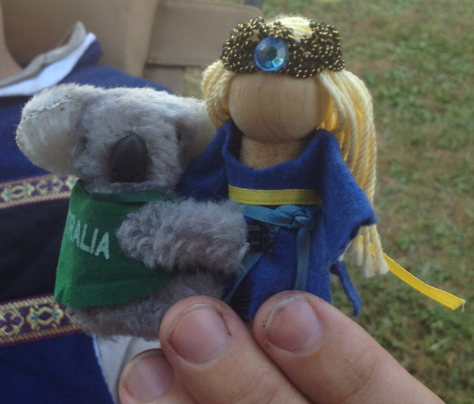 Inspired by the Mini-Queen Cassandra of Caid puppet that was romping around Pennsic after her unfortunate early departure from the event, I made mini-Niall and mini-Liadan dolls that made their debut at the first event where they were at two separate events on the same weekend. Said events were Great Southern Gathering and Spring War. The puppets seemed to have fun at both events, that’s for sure! 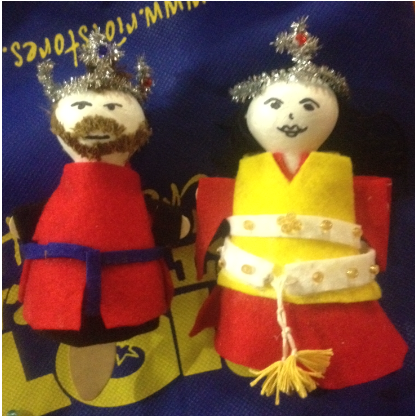 The felt garb on the puppets were modelled from the coronation garb of Their Majesties. 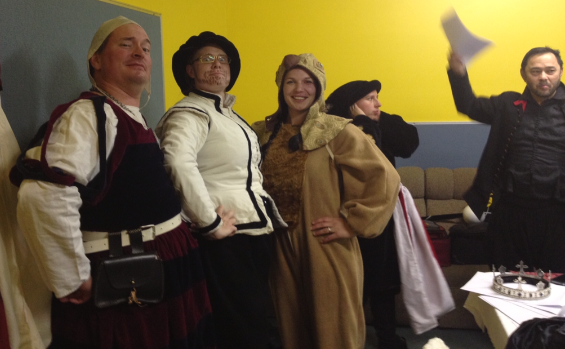 Lastly, at Rowany Yule, I got to read a missive in court from the Baron and Baroness of Politarchopolis (Crispin and Joan) to the Baron and Baroness of Rowany… about a seer and some broken spears and oak seeds not growing , or something…. it was fun! What’s on the horizon in 2014? – Embroidering an applique and goldwork patch for the WoCOB laurel cloak project. – Writing my Sweet Bag documentation. – Continuing a blackwork collar and cuffs for Sir Gabriel (owed as a promissory from Great Northern War). – Making a 16th century Saxon outfit (including a chemise, gown, coif/caul, hat) with my newest apprentice sister, Her Excellency Ginevra. 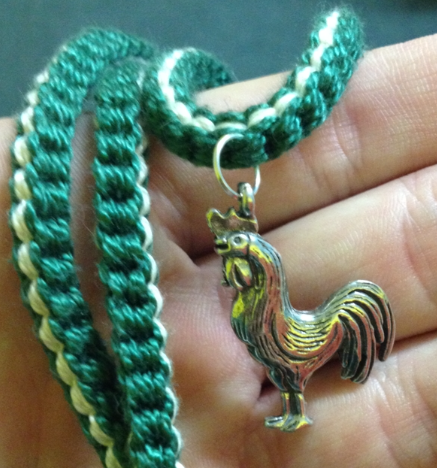 – Continuing on my rapier journey, with aims to attempt the Journeyman rank in 2014. 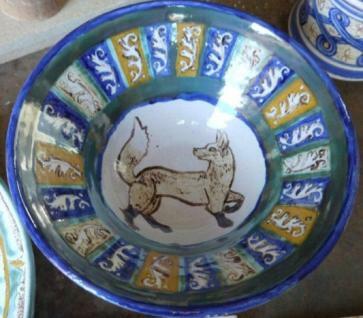 – More travel, including May Crown in Aneala, Great Northern War and (if I can manage it) I dream of going to Pennsic again. – All of the things, probably.